This is the recipe card (two-sided), on which I based my June 1 Packet In The Kichen recipe column, a story about coming across the recipe in my later father’s files. 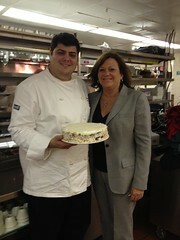 I also wrote a post for this week’s Nassau Inn blog, in which I described my own making of the cake – visually it can’t hold a candle to the one baked by Nassau Inn Executive Chef Nino LoCascio, pictured in the article with General Manager Lori Rabon! I don’t know whose handwriting this is, definitely not my mother, Jane Bahadurian’s…anyone? I know the link to the Packet article won’t be available for long, so view it while you can, if you aren’t, like me, a loyal print subscriber!